Pinnatus or Long finned Bat FishThis gentle exotic beauty comes from Indonesia, the Philippines and New Guinea. It grows to about 18″-20″ in length. When small (2″-4″) it is usually black with an orange to bright red band around its entire body. As this bat fish grows it becomes lighter in the center part of its body and gradually develops black at the tips of its fins. In nature the pinnatus bat can be seen swimming in schools among submerged branches of mangrove trees. They sometimes play dead near the surface or move very slowly from side to side floating near the bottom. This is the most colorful of four types of bat fish offered to the aquarium trade. It is also the most difficult to keep. It should be kept with others of its kind, by itself and apart from aggressive tank mates. Q: Why are periodic water changes necessary in marine aquariums? A: Water changes are performed for two basic reasons. 1) To replenish elements metabolized by captive marine pets and consumed by the biological filtration. 2) To reduce the naturally occurring build-up of organic wastes. Some of these waste ions include phosphate and nitrate. Q: How much water should I changes and how often? A: 25% per month or 10% every two weeks is usually the best. Always be sure the marine salts are dissolved completely and are at the proper temperature and specific gravity, before adding to your aquarium. Aquariums that require 25%-50% water changes weekly indicate basic underlying problems with the initial set up or a failure of low end/economy equipment. Q: Will using additive and supplements take the place of a routine water change? A: No. 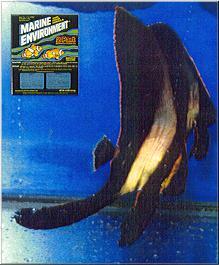 Additives are used to supplement the needs of specific captive animals. Q: What additives should I use on a regular basis in a marine fish and/or reef tank? A: Before any additives or supplements are selected, you must be using a marine salt that is similar in composition to natural seawater. Marine salts are sometimes contaminated with silicates (Instant Ocean®,Reef Crystals®,Kent® Salt) or continually contain heavy metals (Tropic Marin®,hW Marinemix®) can not be corrected. Marine salts that vary dramatically from package to package, or exhibit chronic deficiencies or excesses are not suitable for use with any additive or supplements.Coralife®,Red Sea®,Crystal Sea®,Deep Ocean®. These salts are considered unreliable and a poor choice when selecting a consistent seawater medium. It is impossible to establish a routine additive schedule with products that are proven inconsistent at the point of manufacture. Q: Now that I have found a true seawater formulaBIO-SEA® or a good economy saltCoral Marine™, what additives do I use? A: When mixing new salt water for initial tank set up or for water changes, use HYDRO-SAFE™. This is a time tested formulation that will dechlorinate tap water, destroy the bond between chlorine and ammonia (chloramine) and bind heavy or toxic metals into a fish/reef friendly state. It is a natural stress/shock reducer as it maintains the natural slime coat on marine animals. It is ideal for use in acclimating, shipping or treating marine fish and invertebrates. A: If pH drops below 8.2, use BUFFER + dKH Generator™. This product will adjust and maintain from pH 7.0 to 10.0 to automatically stabilize at pH 8.3 It also adds a controlled amount of calcium to the marine aquarium. A: If your tank is heavily stocked with marine fish and/or live corals, you can add AQUA CAL™,REEF IODIDE™,STRONTIUM + MOLYBDENUM™,TRACE ELEMENTS andBIO-ELEMENTS™. You will need less of these supplements with BIO-SEA® vs. CORAL MARINE™. A: If you want to promote algae or sea plant growth use either:MARINE GREEN™ orBIO-SEA GREEN™ orMACROALGAE IRON ADDITIVE™. A: If you want to ensure against possible vitamin deficiency, use:MARINE VITA-PEP™ orCORAL REEF & MARINE FISH VITAMINS™. These additives can be added directly into your marine aquarium, or foods can be soaked with them. Q: If I use MARINE ENVIRONMENT® dual phase formula™ do I need any additives or supplements? A: Not usually. If you make routine 25% monthly or 10% biweekly water changes, there should be no need to use any additives. However, if your aquarium is heavily stocked with live corals, you may want to test for calcium, iodide, dKH. If you suspect your system is consuming a disproportionate ion or element you will have to use one or more of the additives described earlier. However, the amount and frequency of these additions will be greatly reduced with using the dual phase formula™. Q: Where can I get information regarding fish compatibility? A: There is no comparative compendium commercially available for every situation. Some basic rule, however are: 1) Generally big fish eat little fish. 2) Delicate or long finned fish often are attacked by short finned aggressors. “I.e. Triger fish should not be mixed with butterflies.” 3) For every naturally occurring environment there is known a “pecking order.” E.g. Animals from different locations may respond unpredictably when mixed. Learn and understand which part of the ocean or reef your specific pets come from. If you have butterfly or subspecies angelfish, they will most likely require a diet of life corals, crustaceans and a variety of quality prepared foods. Q: Will fish from the same part of the ocean or reef live well together? A: There is one very important consideration when selecting marine animals for display. Usually more fish are put into an aquarium vs. the same volume of water found in nature. Most hobbyists have a tendency to over crowd and sometimes under filter their aquariums. Overcrowding can cause unnatural aggression when fish compete for living and hiding places. On the reef, butterfly fish, tangs, angels and some trigger fish can be found in a location that could span 1/8 of a mile. Many times, these animals will not live together in the same aquarium. The trigger fish could end up attacking the butterfly fish. Some tangs, when placed in overcrowded environments become very aggressive. Adult angelfish can develop territorial behavior and demand the entire tank for themselves. It is always best to choose small to medium size pets and allow them to grow along with tank mates. Always give each of your fish multiple hiding places. Avoid choosing fish of the same size and family. They will instinctively compete for the same hiding places.